New to us in the UK it may be, but Tsakiridis Devices is a brand with over two decades of history. 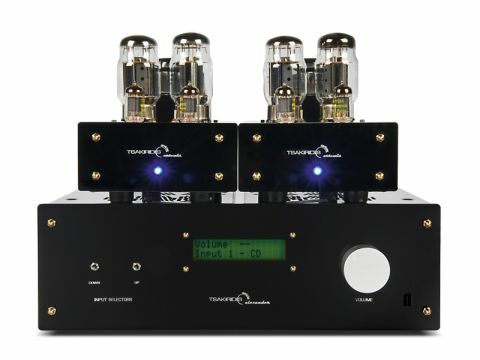 A family-run outfit from Greece, it makes valve-based audio with the emphasis very much on affordability. Many of the basic themes will be familiar to valve aficionados, including the use of simple circuits with little or no feedback, thus ensuring that the valves' character is unchecked, for better or worse. The Artemis power amp comes with a choice of EL34 or KT88 output valves fitted. Small-signal amplification and drive for the output devices are provided by a pair of 12AT7 valves at the front and the simplicity of the circuit is obvious when one looks inside the case. Of the two large transformers, one is for mains, one for output. Two top-mounted toggle switches give options for more or less feedback and for triode or 'Ultralinear' (tapped primary) operation. The Alexander preamp is built into a large case, mostly made of polished stainless steel (as is the Artemis), with a dark plastic front panel. Again, there's plenty of fresh air inside, the audio circuitry requiring just one valve (E88CC) per channel and a handful of passive components. Five inputs are provided, four on phono connectors and one on XLR, but this last is not in any meaningful sense balanced as one side of the XLR is connected to ground: the same is true of the XLR output. The volume control is motorised for remote controllability and input switching is by relays.